My Blog Is Making Things Awkward. I wish I knew how to make people stop apologizing to me for not reading all my posts. It happens all the time. I’ll be in casual conversation and suddenly be accosted by a plethora of apologies for someone not reading my every written word. It takes many forms, but the scenario almost always includes a reason they don’t read it every day (busy, see it in inbox and intend to read it later, don’t read much) followed by an excited recall of the last one they’ve read in striking detail so that I know they actually do read it sometimes. Firstly because I don’t really care if people read it every day. It’s certainly nice to have readers, and I’m floored by the folks who try to read every word. But I don’t sit around my apartment, brooding over so-and-so who didn’t mention anything about yesterday’s post. It actually never occurs to me to wonder which of my friends read and which don’t because, quite frankly, I don’t actually know most of my readers. I’m quite startled when someone I actually know tells me I had a good post recently – because I forget that people I actually talk to could know that I’ve eaten a cricket or pole-danced the night before. I prefer to ignore it. I don’t know how to make people stop apologizing. I’ve at least gotten to the point where I can spot the fear in their eyes and as soon as I hear the word “blog” I stop them dead in their tracks and emphasize that it’s really okay and that I really don’t mind and am flattered they even know I have a blog. Unfortunately, they rarely believe me/accept it/stop talking. As in any predicament, there is a flip side. There are folks who read my blog every day or darn near close to it. And those folks neglect to converse with me at all because they now have daily access to my brain and have no need of a personal interaction. Which, to be honest, the hermit inside me is absolutely thrilled about. I’d be pretty down for just conducting all social business online. I don’t really like people. They disturb me. Which is why I really have to find a way to stop the apologies. It’s just too awkward; I can’t take it anymore. 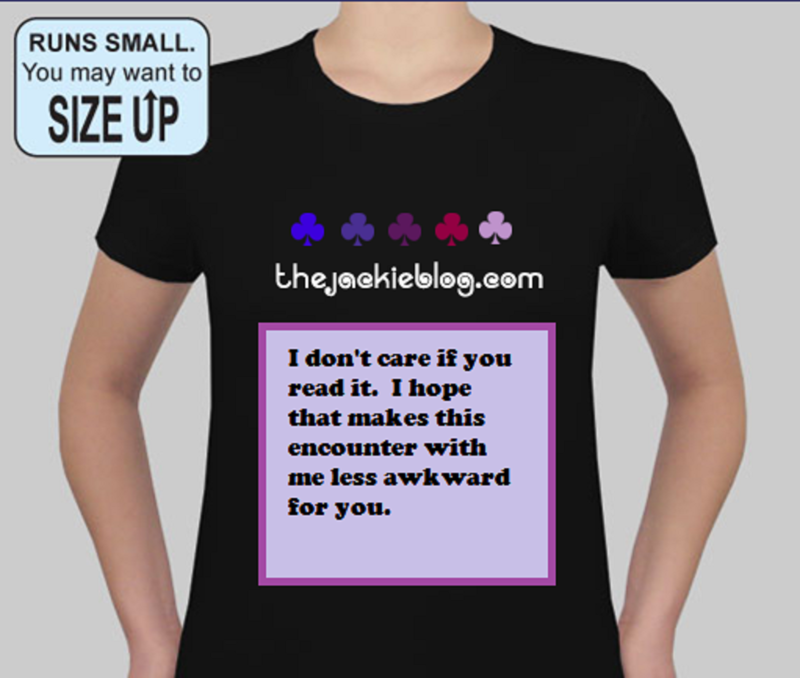 I thought about sewing on “I don’t care if you read it” on the bottom of my jackieblog.com t-shirts, but that seemed overkill. Besides, I can’t always anticipate when I’ll be accosted, so I’d have to wear the t-shirt every time I leave my apartment. That will add up to some pretty frequent laundry loads and that’s unacceptable. I could just start every conversation with someone who hasn’t already apologized to me by telling them not to apologize, but that’s even more awkward. If they don’t read it, they’ll feel like I’m calling them out and drop their subscription because they’re scared I can track them with WordPress.com’s super awesome site stats and summary (for the record, I can’t). If they do read it, they’ll be equally insulted by the accusation that they don’t. I’m out of ideas. Maybe I just have to accept that people will be forever apologizing to me for something which I don’t hold them accountable. OK – I really AM sorry I missed that one! sorry i missed your blog over the weekend. can i have a T-shirt? LOL there may actually be an opportunity for some blog paraphernalia in your future. Print the T-shirts. Don’t worry about other people, or whether they read it or not. Me, I read you every morning to get my day started. But I know what you mean. I’m a blog veteran who had one for about 3 years. It got tiring and I quit. I hope you continue. Good Luck with the remaining year. You can do it. You read me to get your day started? *blush* Thanks 🙂 And thanks for the encouragement! Dry spells are scary places to be and no matter how much of a roll I *think* I’m on, I know they’re coming back any time. If I were you, I would institute a weekly Friends and Family Blog Quiz, to separate the wheat from the chaff, love-wise. Would that be bad? I have the opposite problem. Except for a few devoted (hence more beloved) family members, nobody from my “real” life reads my blog. Few even know anything about it. It occupies a lot of my life, but how do you bring it up without sounding vain? “Yes, when I was Freshly Pressed last time…” Blank stare. LOL I know – I could barely contain myself the first time I was FP. I wanted to take the day off work and run around the block. But no one understands. But the time you lay out what it means and how cool it is to you, you lose your steam. Apologetic people is a pet peeve of mine. You really don’t need to apologize for half the stuff that these people apologize for on a daily basis. I think it defeats the purpose of saying sorry. Like you know…actually being sorry, which most of them aren’t. you could put it on a button instead… like those giant “It’s my brithday” buttons from the dollar store… but with “Don’t apologise to me about my blog” or something similar. You might need more than one button to fit the message large enough that you don’t get people squinting and moving their faces wayyyy too close to your chest. BUT – it wouldn’t increase your frequency-of-laundry. ooooh I like that. and I can wear it with a variety of outfits. I have the exact same thing! The majority of my blog readers are people who I’ve never met- those who live in Malta, emigrated here, or are looking for info on doing it. But I also have it linked to my facebook, just in case any of my friends/family want to read it, but I don’t really care if they do or not- but for some reason I always get the apology for not reading every post, and the in depth discussion of a post they DID read. Some people who just find out about the blog now are apologetic for not having gone through and read the old posts- thats over a years worth of posts, I’d be more concerned if they HAD taken the time to read them all!